When looking for a car, consumers take many factors into account: price, safety, luxury, power, exterior, mileage, environmental impact. Yet, they tend to ignore one very important component: fate. There’s a saying that people don’t get the dog they want, they get the dog they deserve. The same can be said for automobiles. Sometimes it’s just meant to be. I’ve spent the past few months trying out different rides. I’ve selected them based on my tastes, but then an opportunity arose to put it all on chance. I took it. The mystery element inspired me. In keeping with this spirit, I decided to rent a car for the trip to Guelph and used Enterprise Rental’s “You click. We pick” deal. You reserve a car online at a fixed rate. The day you pick up, they give you whatever unbooked car happens to be on the lot. It’s a surprise. Turns out, thanks to the “you-click-we-pick” Wheel of Fortune, I’d rented a 2018 Jeep Grand Cherokee for the weekend for $68.11. Spontaneity paid off. There was a little irony mixed with my fate. If ever there was a make of automobile that I would never, ever, choose to drive, it would be a mid-size Jeep SUV. I’ve always thought there were two kinds of people – Jeep people and not-Jeep people. I was in the latter category. Most of the activities you would associate with Jeep were ones I do not find appealing: hauling things, camping, being adventurous. I spent Friday and Saturday in the Grand Cherokee navigating Toronto and hated it. This had nothing to do with the interior, which was roomy and comfortable. I simply found the car’s size unsuited to the city’s congestion and tiny parking spaces. It felt as though I was wearing the wrong coat. I’m used to driving a minivan – made by the same company – but found the Jeep Cherokee even more awkward. It just didn’t seem to fit. Sunday was different. I drove off in the early morning for the short trip to Guelph. It was a rare sunny day and the roads were dry. 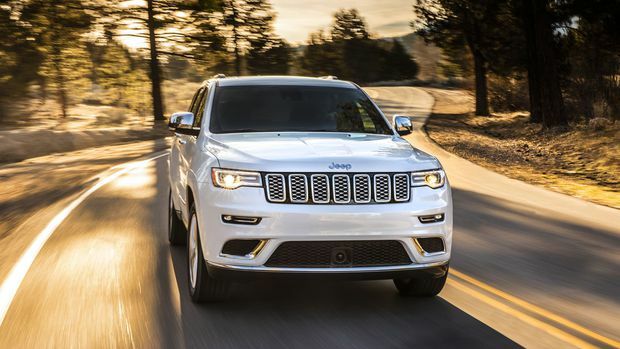 Here, the Jeep Grand Cherokee really came alive. The ride was smooth, and the rear-wheel drive gave it pep. It loved a clear highway. As the countryside rolled by, I began to wish I had something to haul. The Grand Cherokee’s Selec-Terrain AWD system offered the option of matching its four-wheel capability to different driving conditions. There was Snow mode for more traction on ice, Mud for low traction on slushy, muddy surfaces and Sand for, well, sand. I began to resent the sunshine and hoped for a little inclement weather. The Grand Cherokee was getting me in a rural frame of mind. Driving the Grand Cherokee in Guelph on a Sunday morning was also a natural fit. I began to daydream about moving out of the city and getting myself a SUV. I could drive on empty highways and park in wide spaces. I could have friends and offer to haul things for them. In this respect, thanks to a little fate, the car made the man. I parked next to the Bookshelf Cinema and went in to meet the audience. Their surprise film? Stan and Ollie, the excellent Laurel and Hardy biography starring Steve Coogan and John C. Reilly. I spent the day talking about the legendary comedy duo and the afternoon drive back enjoying my jaunt as a Jeep Grand Cherokee jockey. It didn’t change my mind about owning an SUV in the city, but it sure made me see the appeal. A Grand Cherokee in the right environment could make a lot of sense – and that was a surprise.